In the computer world, we have experienced with a revolution of technological advancements. The paradigm shifting from Text Operating System to Windows, Internet Evolution, Search engines, eCommerce, Mobiles, and Smart phones have opened up plethora of new opportunities and so the product developments. Successful are those who have learnt and adopted to these innovations. In this journey, IoT (Internet of Things) is another evolution exploded with a Giga-size opportunities both in hardware and software. Utilizing the latest ultra-low power embedded devices connected to the internet, IoT allows the users to access ‘smart’ data and simultaneously control the system independently. The IoT is a world running on cloud based services and applications with smart devices (edge nodes or things) and systems (aggregators, collectors) networked together. These devices are essentially embedded systems and smart objects connected to internet with unique IP address which can be discovered and communicated over internet. They use IPv6 addressing scheme which overcomes the limitation of IPv4 (supporting upto 4 billion unique addresses). Many market research reports suggest that anything around 50~100 Billion IoT enabled devices are expected by the year 2020. The IoT landscape is moving from higher-level, cloud-based processing to a distributed intelligence model in which data-driven decision making is migrating towards the edge nodes (things). The processing at the end node level is promoted as the devices have more sophisticated processing power and the ability to communicate important trends or differentials. Predictive data at the fingertips enable better, faster and empowered solutions – Thanks to the vast and growing technology of IoT. 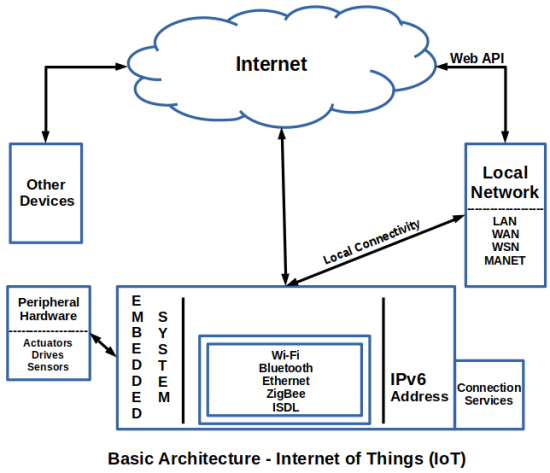 The basic architecture of IoT is presented in the below diagram. Various frameworks / topologies have emerged in the IoT market to facilitate smoother interconnection of IoT devices / objects in the IoT market, thereby enhancing the smart products to become better, safer, and smarter. 30% Hardware, 30% Software and 40% Communication Protocols/Standards collectively constitute to the Internet of Things components. The set of devices or physical objects which are responsive in nature, have the capability to retreive data and follow the instructions is termed as IoT Hardware. The set of programs which enable the data collection, storage, processing, manipulating and instructing to and from IoT hardware components are called IoT Software. The operating systems, middleware or firmware, apps, etc., are few examples. Though the semiconductor chips represent only a key portion of the value chain in the IoT, the semiconductor companies’ focus on silicon may not be optimal. So, by providing comprehensive solutions that involve security, software or system-integration services in addition to hardware, the companies are transforming from component suppliers to solution providers. This could also enable the chip makers to capture maximum benefits in the IoT chain while the risk of expanding ventures outside their core strength still remains. Also, some makers have limited their R&D expenditures for IoT-specific chips. The IoT will drive higher growth in application-specific microcontroller units (MCUs) and flexible System on Chip (SoC) type designs. Anlaysts predict the following challenges in the IoT: 37% Security threats, 27% Data privacy, 9% Access management, 9% External attacks, 7% Compliance requirements, 6% Hardware challenges, and 2% 3rd Party data sharing.